Not many Englishmen have scored hat-tricks in El Clasico. 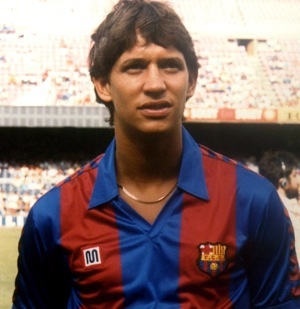 Lineker’s first goal was typical of the man – an instinctive poach from two yards out. His second, ditto (great run to set it up though) – another classic poach. His hat-trick goal was, by Lineker’s standards, a thing of rare beauty – a mazy, 40-yard dribble capped with a thunderous shot. At least that’s the way I’m sure Gary tells it on the golf course. Shame Johan Cruyff then shoved him out on the right wing, a move which arguably stopped the Englishman from becoming a Barca legend. not many people named gary score hat-tricks. period.